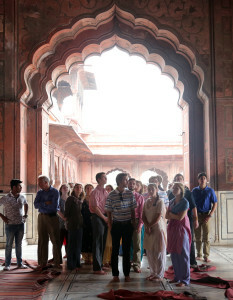 Before leaving for our trip, our World Religions teacher Dayanand said to us, “India is either a place where there are no rules, or a place where there are rules that no one ever follows. I haven’t figured out which one it is yet.” On our first day here in India, we got to experience exactly what Dayanand was talking about—nothing demonstrates the chaos of India more than taking a rickshaw ride through the streets of Old Delhi. With a population of 16 million people, Delhi has an understandable problem with street congestion. Within five seconds of stepping off our bus, I nearly had my foot run over as a car raced by, honking its horn and coming within three inches of my body. I turned around to ask if anyone just saw my close encounter, but I quickly realized that my classmates were having similar experiences—everyone was scrambling to get out of the way of the swerving and never braking caravan of vehicles careening down the street. Eventually we made it to a line of rickshaws that were waiting for us, and breaking into pairs, we clambered onto the rickety carts. As my driver pedaled us onto the main street, I couldn’t help but feel a bit nervous. All around us was the sound of blaring horns as people attempted to navigate into any available space, and on all four sides of our cart we were separated from other vehicles by a matter of inches. I glanced to my right, and saw what appeared to be a family of five on a motorcycle. A little girl, no more than two years old, stood on top of the seat, her small hand gripping her father’s shoulder. With no warning, our driver veered off the main road into an alleyway, and I gaped at our surroundings. Above us were tangled messes of electrical wires, crisscrossing the sky like spider webs. We passed by vendors sitting on the ground selling potatoes, and saw the occasional monkey scampering across the road. As we weaved in and out of people, our driver sung to himself, never breaking rhythm even as he dodged the countless human obstacles before him. At one point, the driver saw a friend of his and took both his hands off the handlebars, patting his friend on the shoulders as we drove past him. I sat in complete bafflement as we sped through the streets, in sheer amazement that we had not hit anything or been hit ourselves. 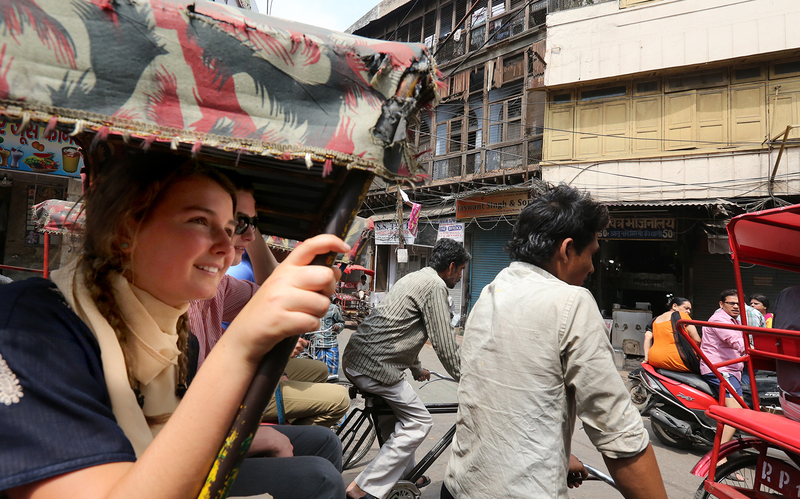 By the time our ride in the rickshaw had ended, any nerves I had had were replaced by exhilaration. I felt like I now understood a part of India; that what I had just experienced through navigating the streets had enlightened me about the country. Because what I am finding out about India is that the only way to understand it is through experience. To the outsider, there is only chaos. But when one looks a bit deeper, they can see that somehow there is a method to the madness. And I intend to keep looking, to keep discovering, until I can finally understand what this country is. So far, it has been a wild ride. The first thing our guide in Delhi asked us this morning was, “Why India? Why go to a place with a population of 1.2 billion people and is known for its air pollution?” I looked out the bus window, at the streets lined with trash, and began to wonder the same thing. As we began moving, the trash on the street began to blur and I tore my eyes away from the ground outside the bus and absorbed the ornate temples, the gorgeous gardens, and the vibrant people that fill the city and make its heart beat with a passion that can be found in no other country. I could feel the historical and the modern coming together to create a chaotic and stunning tapestry, and all at once I was struck by the beauty of it all and sucked into the whirlwind that is India. 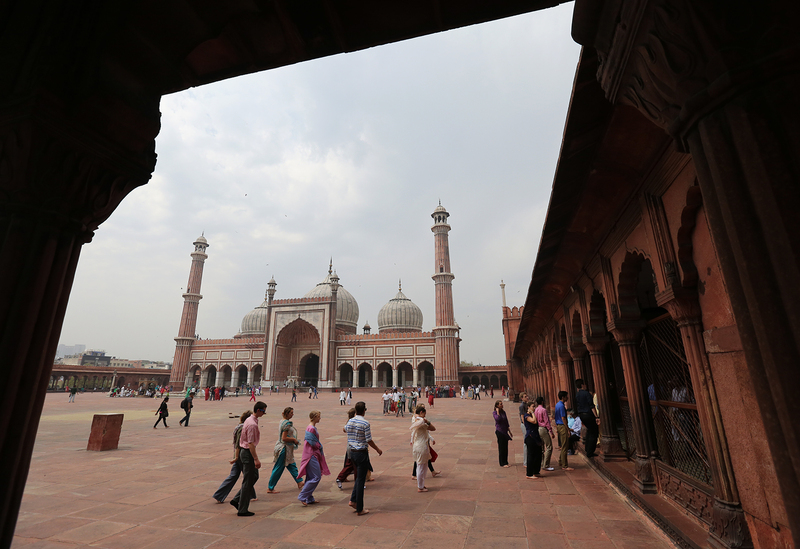 Later in the day we arrived at Jama Masjid, the largest mosque in India. After crossing the threshold into the Mosque, a vast courtyard spread out in front of us. Each inch of the structure was intricately carved with patterns and verses from the Quran. It was beautiful and overwhelming at the same time, and I didn’t even notice when people began standing with our group and taking pictures of us. Today was eventful…. to say the least. Culture Shock, it seems, is the recurring theme of this trip. It hits you like a freight train, or perhaps an out of control rickshaw. Speaking of rickshaws, today on the back of one we had the pleasure of immersing ourselves in the chaotic traffic system that India is so famous for. Before taking us on our adventure our rickshaw driver turned around to Zoe and me and pointed down to a bundle of chains by our feet and said “seat belt.” He meant for us to wedge our feet into the chains and hold on. He bolted out, asserted himself onto the busy street and began pulling us around while weaving himself intricately in and out of traffic. Car horns in India aren’t used the same way we use them in America. Instead of using them to state that the person in front of you is a bad driver or to yell at someone, they are simply used to state your presence in traffic. Needless to say, with millions of cars on the road you hear a lot of car horns. We were taken through numerous tight allies where street vendors were displaying their goods. They ranged from food, to clothes, to jewelry. It was certainly a unique experience. Thankfully, we were brought back to our bus in one piece, and headed off to lunch. Lunch was amazing. I didn’t realize how hungry I was until we got into the restaurant. I ate plate after plate of buttered chicken with naan and rice. The food just kept coming and the black hole that occupied my stomach was ready for more at a moments notice. Once we all had had our fair share of food we left the restaurant and met up outside to decide our next destination. We looked to our left and saw a small crowd looking at a snake charmer. Our group joined the crowd and listened to him play his flute. He gestured to us, indicating he wanted one of us come sit next to him. 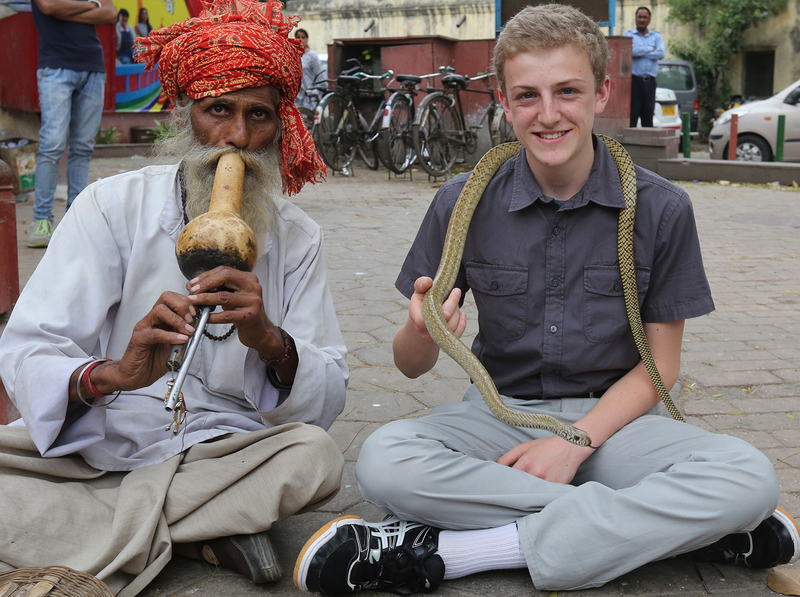 I thought, “This is one of the only times I’ll get to sit next to snake charmer, so why not?” I sat down next to him and what I thought was just going to be a front row seat to watch him charm a snake turned out to be one of the most exhilarating experiences I have had. After I sat down he pulled out a snake and turned to me saying, “Doesn’t bite! Look!” He put the snake on his face and before I could say anything, proceeded to place the snake around my shoulders. I was in deep at this point; I couldn’t go back. He started playing his flute and the snake’s head moved around to the tune of the song. I noticed there were two baskets in front of him; one that he pulled the first snake out of and another that still had a lid on it. He looked over and found me staring at the other covered basket. He then uncovered it and revealed a cobra laying down in it. He poked it so it jumped up and then continued playing his song. He placed the cobra basket on my lap, and my heart skipped a beat. It turned its wide round head towards me and stuck its forked tongue out at me and turned back around to face the crowd. Then just like that, it was over. The charmer pulled both the snakes off of me and I got up and joined my classmates in the crowd. I guess I can mark that one off my bucket list. The courtyard of Jama Masjid.